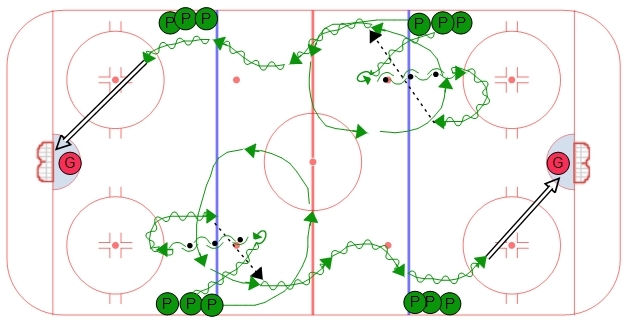 This is another drill that focuses on over-speed skating but includes passing and puck control. Set up four lines as shown in the diagram with pucks. On the whistle two players from opposite lines will go at the same time. The first player will go without a puck and make a large circle out near the red line and around just inside the zone. The key for this player is to gain as much speed as possible by the time they are heading up ice. The second player carries the puck forwards up to the neutral zone face off, transitions backwards with the puck, then times their transition forwards so they can make a flat pass to the first player. Again the key for the second player is to keep their feet moving while handling the puck and time their transition forwards so they jump into the play and make a flat (horizontal) pass (instead of a verticle pass). Once player 1 receives the pass as they are going up ice they attack the blue line inside out. Have them work on lateral movement as they attack the blue line with cross-overs. Once inside the zone the players can either drive wide or use their inside edge to cut to the middle of the ice.